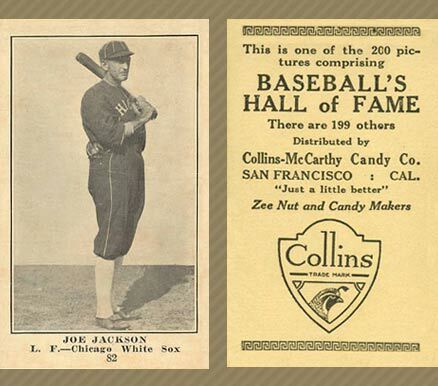 The myth and lore that accompanies "Shoeless" Joe Jackson is a big factor in the collectiblity of his baseball cards and other memorabilia. 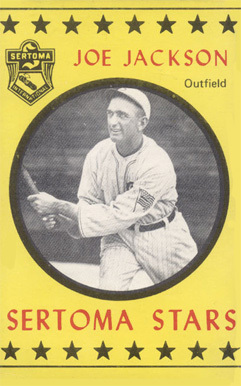 However, it would be a mistake to attribute the astronomical prices paid for his high-grade cards and game-used memorabilia simply to being connected to the 1919 Black Sox Scandal. Jackson's on-field skills were a thing to marvel. He possessed five-tool talents long before the phrase was coined. When Jackson received a lifetime ban from baseball, public opinion was mixed. As time wore on and Joe Jackson's legacy returned to his masterful play and away from the scandal, his popularity grew. As a result, interest in and demand for his baseball cards increased. 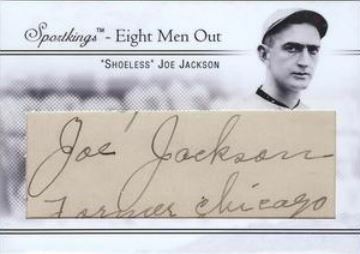 Their are many misconceptions related to "Shoeless" Joe Jackson autographs. It is true that Jackson was largely an uneducated individual without the ability to read or write. As a result, many believe that autographs would be difficult. However, in his years after baseball, many believe he was taught these things by his wife. The couple ran a liquor business for years and, as such, some general ability to read and write certainly would have been required. Many of the alleged "Shoeless" Joe Jackson autographed items that have come to auction in recent years have been clouded in controversy. Some purport that these signatures are secretarial in nature, most likely being signed by his wife. It is no stretch to say that purchasing an alleged "Shoeless" Joe Jackson signed item is equivalent to taking a leap of faith. Even greater caution should be given regarding his alleged game-used memorabilia. 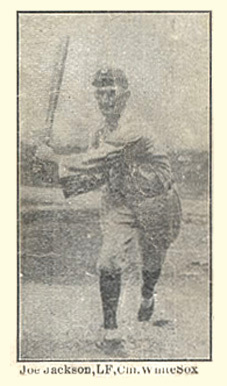 Several reputable auction companies and high-profile authenticators have been part of several sales of game-used bats supposedly used by "Shoeless" Joe. These bats have sold for near seven figures and more. Fortunately for trading card collectors, it's not necessary to have that kind of money to own a piece of baseball history. 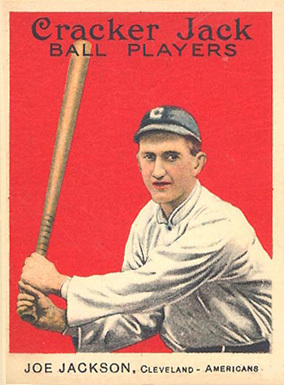 Both Upper Deck and Panini America have included game-used "Shoeless" Joe Jackson cards in their products. 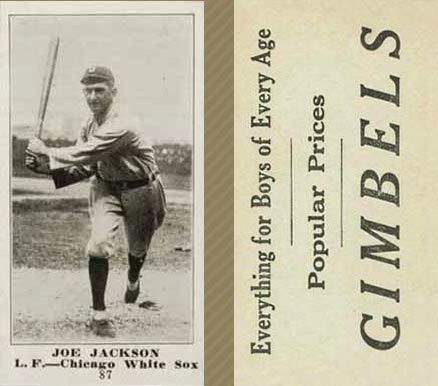 Here is a gallery of some of the more popular "Shoeless" Joe Jackson cards ever produced. 2019 Diamond Kings Shoeless Joe Jackson FOTL Bat Relic 4 5 #DMS-JA! The 1909 American Caramel is the earliest known Joe Jackson card. It is part of a 120-card set, designated in the American Card Catalog as E90-1. 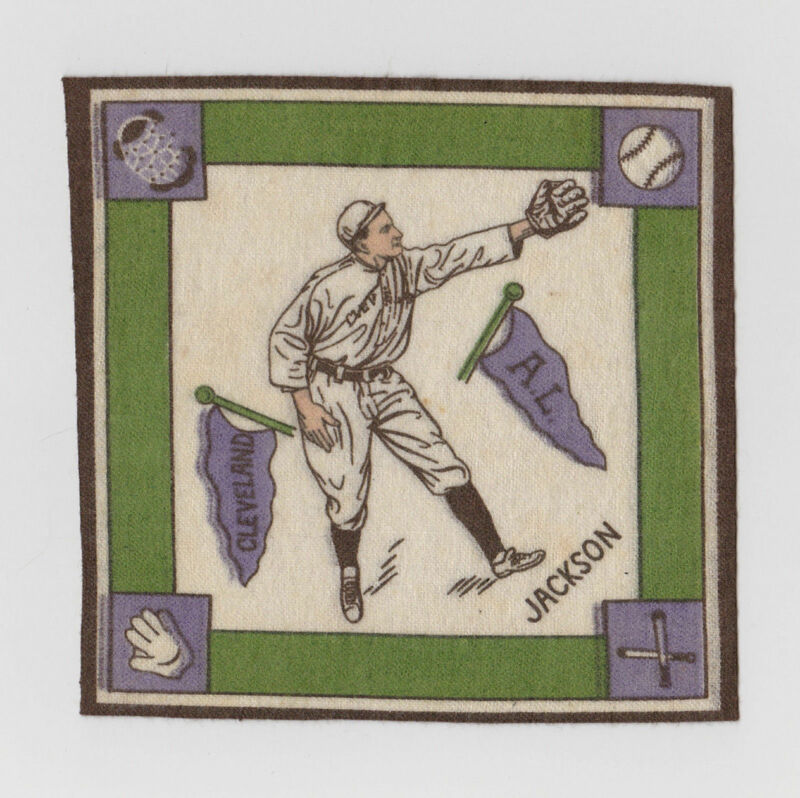 The colorful, cartoon-like nature of the card shows Jackson as member of the Philadelphia Athletics of the American League. The card measures 1 1/2" by 2 3/4". 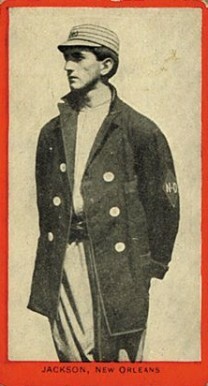 On his 1910 Old Mill card, Jackson resembles a returning Civil War soldier rather than baseball player. 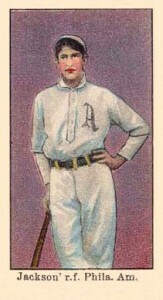 This early card represents his affiliation with New Orleans of the Southern Association. The card has gained popularity with high-end vintage card collectors in recent years due to the condition sensitive nature of the card's red borders. The complete set consists of 114 total cards and are designated in the American Card Catalog as T210-8. The cards measure 1 1/2" by 2 5/8". The colorful nature of this card has made it extremely desirable. Used as an advertisement for the Boston Garter Company, it is one of 12 in the set. The cards are large, measuring 4" by 8 1/4". 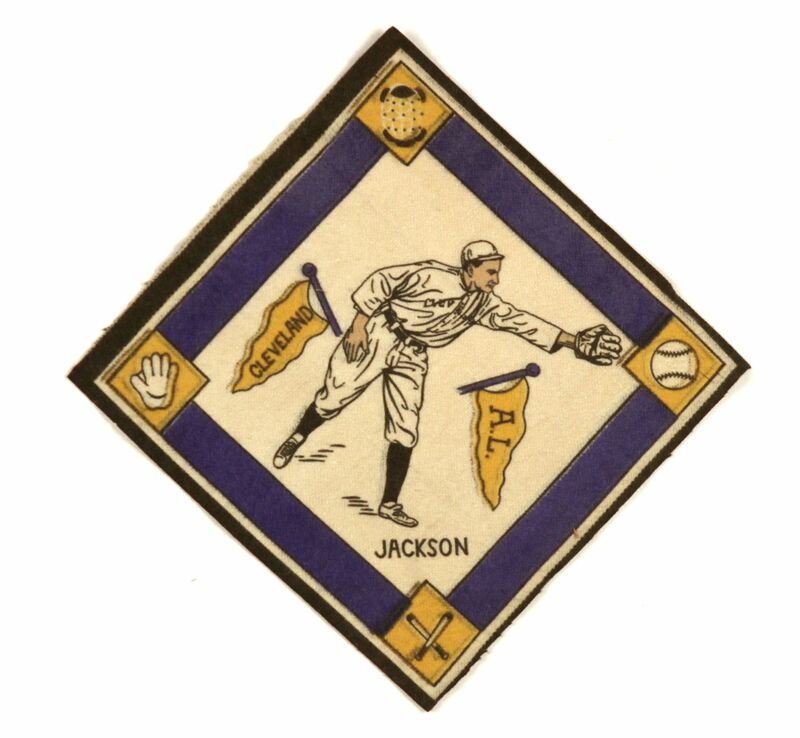 This example from the esteemed 1914 Cracker Jack set is easily the most revered and coveted card from "Shoeless" Joe Jackson's playing days. Part of a set designated as E145-1, the vibrant cards measure 2 1/4" by 3". 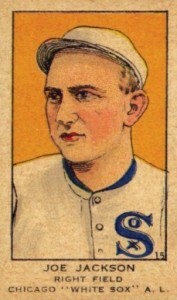 This is one of the last "Shoeless" Joe Jackson's cards produced while he was still playing. Holsum Bread released this card regionally in 1921. 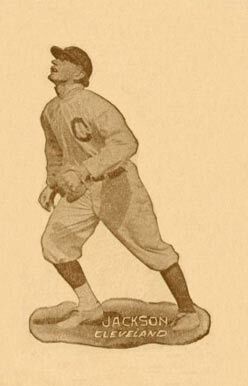 It would be 19 years before another new "Shoeless" Joe Jackson cards would make their way to market. This card, as the name implies, is part of the American Card Catalog designated set W514. It is one of 124 cards in the set. Each measures 1 3/8" by 2 1/2". Another highly regarded set, 1940 Play Ball has an American Card Catalog designation of R335. Part of a 240 total card set, each measures 2 1/2" by 3 1/8". 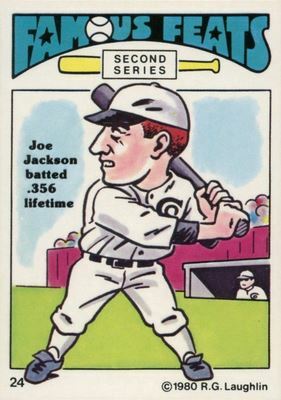 This is Joe Jackson's most popular post-career vintage card. This is the first "Shoeless" Joe Jackson memorabilia card and it created a huge hobby buzz upon its debut. At one time, it traded for over $700 before slipping to the $400-$500 range where it stayed for years. 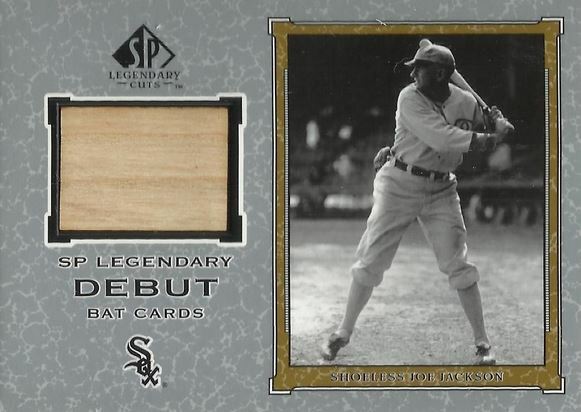 Unfortunately, the proliferation of other Joe Jackson bat cards by other manufactures has diluted the card's value. Fortunately for collectors owing the card, there aren't too many more Jackson bats that are likely to be cut up. That bodes well for this card's value. 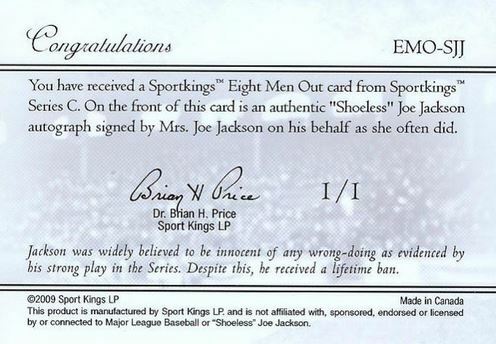 In 2009, this card was included in an insert set of the SportKings product "Eight Men Out." It included cut signatures of members allegedly involved in the Black Sox Scandal of which a film was later made with the same name. The inclusion of this card created quite a controversy at the time because it isn't Joe Jackson's real signature. As you can see on the back of the card, the company acknowledges that the signature is in fact secretarial and was written by his wife. At the National Sports Collectors Convention in 2011, this specially created card was given away to a lucky winner. Inserted into boxes of the 2010 Leaf Sports Icons product were four redemption cards eligible for the random drawing. 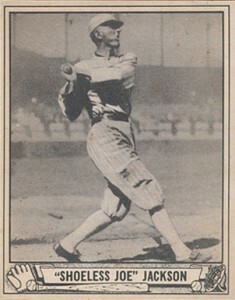 The alleged cut signature of Shoeless Joe Jackson was the first of it's kind to be included on a trading card. 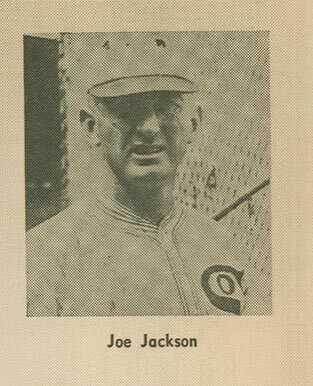 Given the highly controversial nature that exists regarding the authenticity of "Shoeless" Joe Jackson signature autographs, we encourage all collectors to exercise restraint and only purchase cut signatures that have, first, been authenticated by a reputable company like PSA or JSA and then used to create cut signature trading cards. Only then does this degree of dual authentication provide you any sort of recourse should, at some point in the future, the signature end up having been mistaken as authentic.